This is a large area rectangular loop made from 3-core mains cable, connected to a transimpedance amplifier in order to produce a broadband response. The lower leg of the loop runs along the ground but we cannot set base = 0 in the model because the wire would intersect the ground, so to start with, a base height of 5cm is used. which shows that the effective inductance of the loop is 352 uH. If the ground statement is commented out and the command re-run, the inductance becomes 399 uH. The inductance of the loop is being significantly affected by the close proximity of a perfect ground. 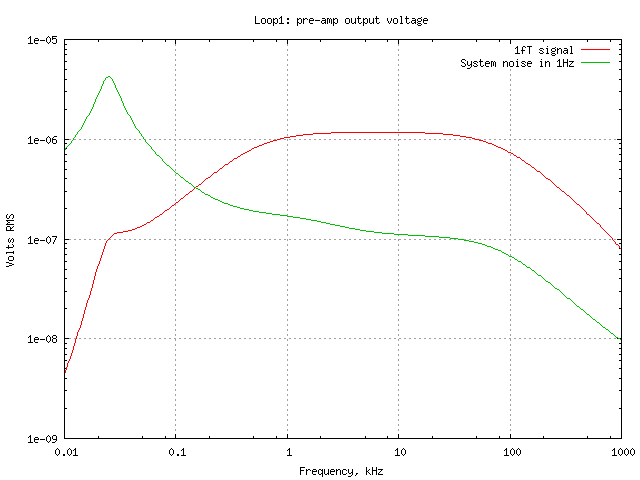 The measured inductance of this loop is 375 uH which shows that the actual ground below the loop is not so perfect. A few minutes of trial runs with a range of coil base heights determines that a value of 18cm reproduces the measured inductance. Therefore the remainder of this simulation substitutes base = 0.18 in the input file. lcng is predicting a resistance of 1.3 ohms and the measured value is 1.4 ohms which is close enough considering the accuracy of the ohmmeter. which we need to use in a Spice model of the receiver. Then after restarting gschem you should find loop1.sym in the component library. Use gschem to draw a schematic and include loop1 as a sub-circuit. It needs two attributes: value=loop1 and file=loop1.spice. In this example, Ct1-6 and Rt1-2 account for the measured resistances and capacitances of the coupling transformer Lt1-2 and K1 is its measured coupling coefficient. Rd is a dummy high value noiseless resistor necessary so that Spice can determine a DC operating point for that part of the circuit which would otherwise be floating. Vout is a netname attribute assigned to the output net of the LT1028 - this allows the Spice simulation to find the output node. Current source IB is set to 1e-15 to produce a 1 fT field. This is quite a weak flux density but would be considered a fairly strong VLF amateur radio signal. The response is reasonably flat from around 500Hz to 100kHz and the 1 fT signal appears about 20dB above system noise at the 8kHz band used by radio amateurs. The measured system noise at 8kHz corresponds to a flux density of about 0.15 fT which agrees quite well with the model. This is more a matter of luck than judgement - Spice predictions of noise can differ quite a lot from measured noise for various reasons. Output voltages are very low - this is typical of loop antennas feeding a transimpedance amplifier and at least one or two further gain stages are necessary to produce a line level signal.